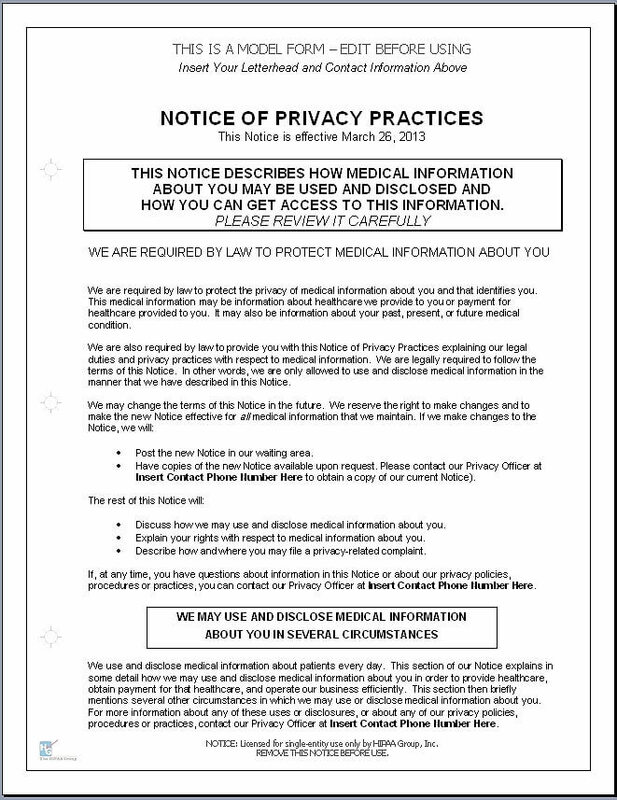 All new and fully updated for the HIPAA 'Omnibus' Final Rule, this legally compliant Notice of Privacy Practices Template is designed to be printed single or double-sided in an 8.5" x 11" format for distribution to patients. Every term and condition required by the HIPAA Final Rule is included, and the Notice is attractively formatted for easy readability. The HIPAA Final Rule made several important changes to the Notice of Privacy Practices requirements, and they are all included in this updated product. Be sure you are distributing the latest, fully compliant version to all your patients. In addition to the actual NPP Template, this product also includes an exclusive NOTES section, with great information on the Final Rule and NPPs from the experts at the HIPAA Group. The NOTES section will help you understand your new duties and obligations regarding NPPs under the Final Rule, and is designed to be edited out after your editing is complete. This template is delivered to you immediately after purchase via digital download in an easy-to-edit format (Microsoft Word required). Just add your practice specific information, make some minor edits, and print as many as you need. Make changes whenever needed, and then print more. 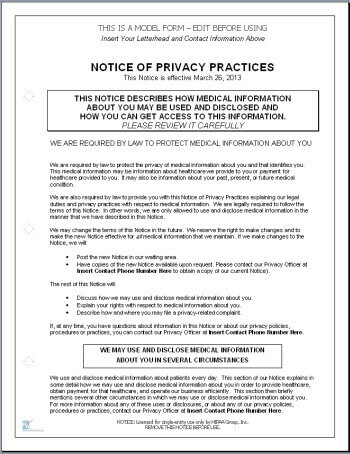 This HIPAA compliant handout will help your patients understand how important their privacy is to your practice, while helping you meet your HIPAA compliance responsibilities. Some editing is required before use.